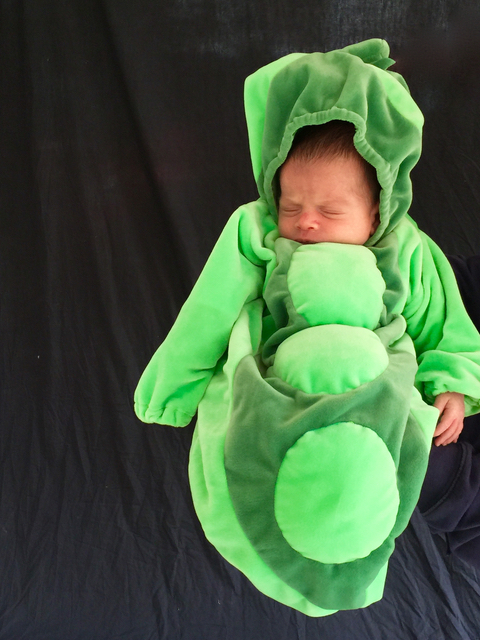 I was really looking forward to Halloween, Ben's first, because I got him a baby costume I've coveted for years. As it turned out, Max and Sabrina had their own firsts this weekend, too. We have come a long way from the Halloweenie Max used to be (and the time someone accused us of ruining Halloween for everyone). 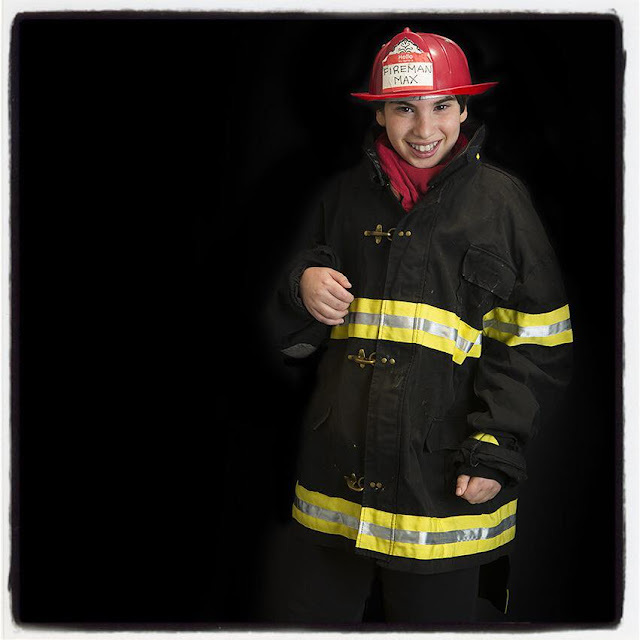 Max now enjoys dressing up, although admittedly he wears that firefighter getup all the time. As my friend Paula noted on Facebook, "'I was wondering what Max was going to be for Halloween' said nobody ever." Max decided to skip our town's Friday Halloween party, not because he was scared but because he wanted to play in the park (his favorite hangout). 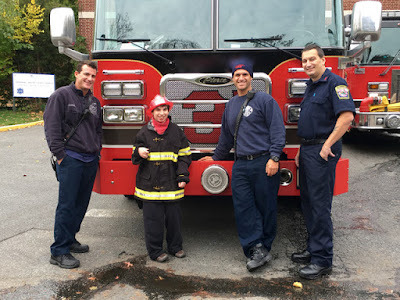 Saturday, he stopped by the fire station to bring the guys candy and pose for more photos because he only has eleventy billion of them. Max really looked forward to trick-or-treating. "Thank you!" he said every single time after he got candy, which he's never done before. His manners have really kicked in lately, although we are still working on "Excuse me." When he burps, he thinks it's funny to say "Thank you!" although he knows full well what he ought to say. 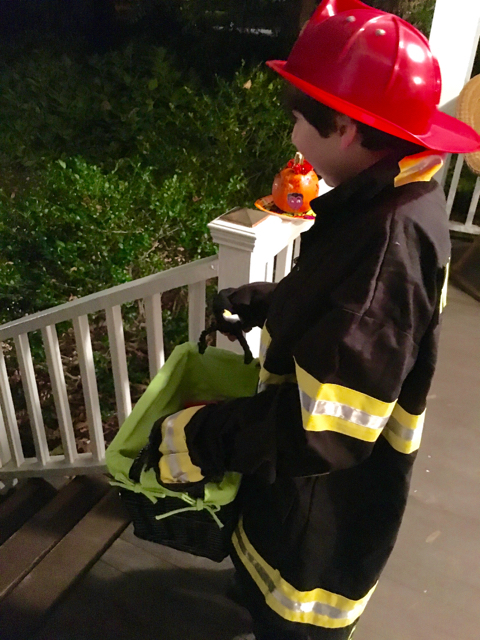 When Max came home and hung out on our porch to greet trick-or-treaters, the Great Halloween Miracle of 2015 occurred: Max grasped the basket of candy WITH BOTH HANDS and offered them sweets. Maybe this doesn't seem like a big deal, but Max doesn't much like to use his right hand (the stroke he had at birth was worse on the left side of his brain), or use both hands at once. This week, Max's occupational therapist pointed out that he still has that asymmetrical tonic neck reflex (ATNR), typically found in babies. When an infant turns his head, his arm and leg on the same side extend and lock into position while the opposite limbs bend—the fencer's pose. After she told me that, I watched Ben doing it, and then clear as day I saw it in Max. I Googled and it's pretty common in kids with cerebral palsy. The OT noted that, among other things, the ATNR tends to prevent Max from using both hands. 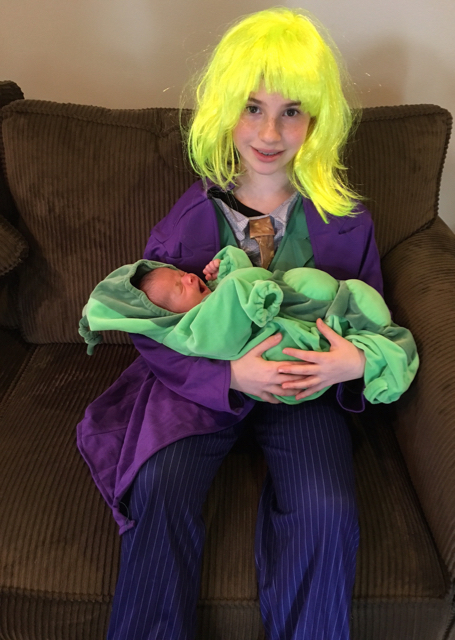 Sabrina dressed as The Joker. 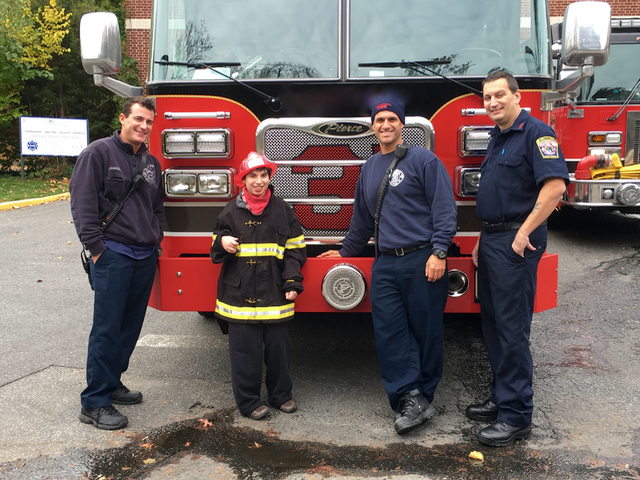 For the first time, she decided to spend the evening with friends in another neighborhood. That gave me a case of the she's-growing-up-fast blues, diminished only by the fact that she still looked very cute in her wig. It was Ben's first Halloween but all three kids had firsts. They all look great. Yay for progress and growing up! I think Sabrina's costume is amazing. Love the sweet pea. Happy for the big kids with their big first. Baby Ben!! Such an adorable costume! This photo is an instant classic.